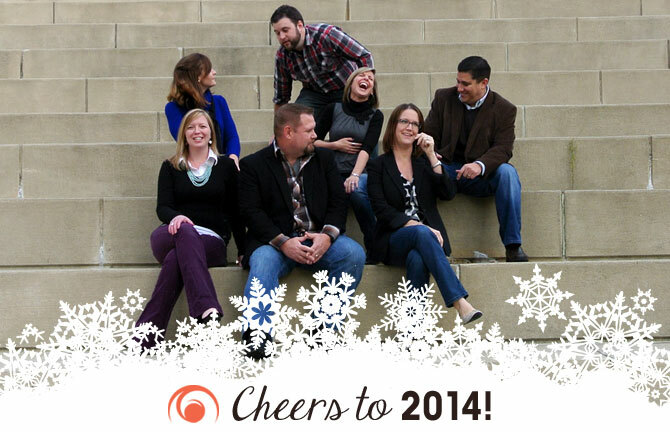 Array had a great 2013 — thanks to some awesome clients and our super talented, hard-working staff. But of course it wasn’t all business for the team, somehow we managed to make the time to partake in some general silliness (like the double bubble challenge!). This past September, for example, the team filled their bellies full of gyros and baklava at the Akron Greek Festival while Tara and Cathy had colorful paint hurled at them during a 5K Color Run. And when planning to take time off from Array, be prepared to come back to a desk covered in… who knows what! Ian’s station was wrapped in TP and rubber bands and Cathy’s in all things banana (a food that completely grosses her out). The team practically gave up when it came to Shawn’s desk simply by leaving all their trash! But most fitting was T-Rex Tara’s toy dinosaur oasis. We can only imagine what 2014 will bring… here’s to the New Year!